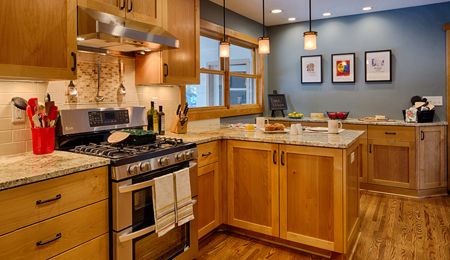 Our team here at Artisan, along with the home remodeling experts over at Excel Builders, built a one-of-a-kind kitchen for our clients in Eden Prairie. The homeowners were so pleased that we couldn’t help but share a summary—with pictures!—of this kitchen remodel with you. Clever storage: Our storage solutions go beyond the cabinets. In this kitchen, for example, included were adjustable hooks above the stove for quick access to items these homeowners use on a daily basis. Angled cabinets: One of the greatest benefits of custom cabinets is being able to craft a cabinet to fit any space. Here, we built in an angled cabinet with a door to make the most of the space by the doorway. This makes the cabinet unique and fully functional. 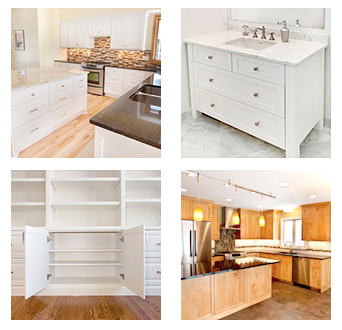 Smart extras: Artisan Cabinet Co. offers more than great storage when designing and building cabinets for your kitchen. We think outside the box to make smarter additions to your space. For instance, electrical outlets are placed in easier-to-use locations, including on the outside of the lower cabinets. We also included magnetic board on the inside of a cabinet to cleverly store those to-do lists, coupons and other items our clients wanted in reach, but not in sight. What we personally love about this kitchen renovation is that it truly exemplifies what it is that makes cabinets from Artisan Cabinet Co.
Clean lines: Everything in this kitchen is easy on the eyes. And easy on the eyes means easy on the mind. Great joy was taken to design and build our custom cabinetry that brings peace of mind to any homeowner, from the busy parent to the budding chef. Easy access: Functionality is considered in everything we do. This means, for one thing, making sure that lower cabinets have pull-outs to make it easier to reach items at the bottom and back. Do You Like This Kitchen? What Would You Do Differently? If you’d like to know more about any of the design aspects that we used when creating this great new kitchen in Eden Prairie, call us at 952-737-7088 or to send our custom kitchen cabinets team an email. We also welcome your feedback—what’s your favorite aspect of this kitchen? What would you do differently in your own home? Share your comments here!